Paddy production decrease this year. But the increament in production of wheat by 13% last cycle contributed the HHs food stock. Market food stock is sufficient. Income through cash crops like; vegetable, fish, mango, livestock products like; meat, meat, egg and fish are normal. Income through remittance & seasonal migrants to cities are also normal. Wage labor opportunities are increasing. Food consumption level for basic food is good. 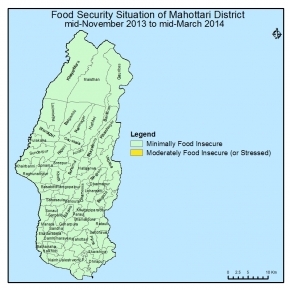 No significant cases of natural disaster, Human epidemic found that could make HH food insecure. Sufficient drinking water available. Social security & Acute child malnutrition situation are also normal. Market price of course rice and wheat flour also grown up. So, District situation at 16 indicators out of 17 fall in phase 1 through out Cluster A and 14 indicators out of 17 falls in phase 1 within cluster B VDCs.That's why, the district situation is Minimally Food Insecure. During the next cycle, the production situation of major winter crops like wheat, oilseed & pulse looks normal. The recently harvested paddy production will support HH food stock. There will be normal income situation through the sale of cash crops like winter vegetable, sugarcane, meat, livestock products, and fish. The income through wage labor, short-term migrants to cities and remittance will support the access to food. Market price will be affordable and market stock of main staples will be sufficient. So, the district will be minimally food insecure for the period.